We live in an age where smartphone use has become popular. A recent study even showed that in terms of global use smartphones have now overtaken feature phones. Unfortunately, because smartphones have become popular it has also brought about several problems most notably mobile phone thefts. Several measures are already in place to prevent a phone from being stolen however one company has an innovative product that it wants to introduce into the market. 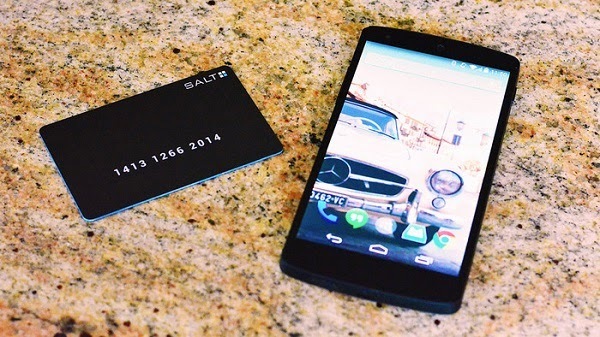 Meet Salt, a keyless entry for your smartphone that’s the size of a credit card and easily fits in your wallet. What it does is it automatically unlocks your Android smartphone if it is within 10 feet of your phone. Once a person is outside the 10 feet radius the phone automatically locks itself. This makes it convenient for you to set a strong PIN since you won’t need to constantly enter it whenever you want to access your phone. Let’s say you are in a bar with your friends and your smartphone is on top of the table. If you leave your phone to go to the restroom perhaps then it will automatically lock itself. Once you return to the table your phone will automatically unlock itself. This saves you the hassle of entering your PIN while keeping your data safe. Another use of Salt is that it can be used to find where your wallet is. If you leave your wallet somewhere you can use your smartphone to find out where your wallet is. Makes use of high security. Over 281 trillion possible combinations can be used as your PIN. The Salt keyless entry is just one half of the product while the other half is the Salt app that needs to be installed in your Android smartphone. The company behind this product is running a funding campaign over at Indiegogo with the goal of reaching $50,000. A total of $11,382 has already been raised as of this writing with 19 days left to go in the campaign period. If you would like to support Salt you can pledge $13 which will get you 1 card to be delivered this December.